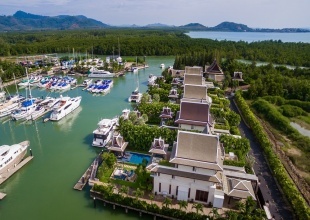 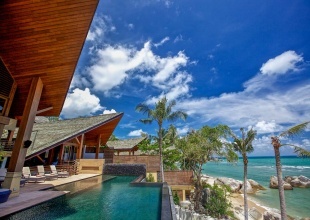 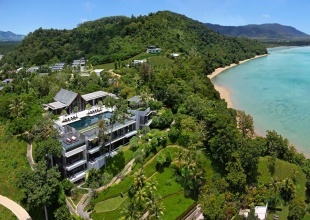 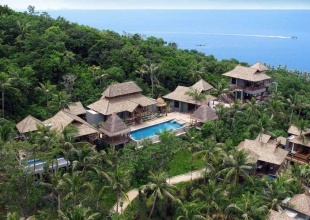 Samujana is one of Koh Samuis most exclusive addresses, a gated estate with full management and 24 hour security. 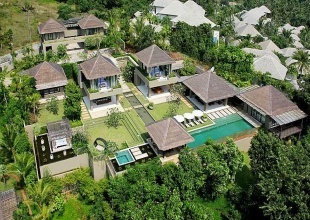 Each of the villas was designed by internationally acclaimed architect, Gary Fell, who is behind some of Asias best developments.Samujana Villa 6 is offered at USD 3,500,000 and has been converted to Thai Baht for this site. 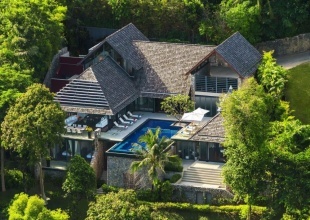 Villa Yang can be considered a sister villa of Villa Yin, similarly perched on a private cliff where you can almost touch the sky, on the prestigious Millionaires’ Mile row in Kamala headlands in Phuket, Thailand.The villa is a sophisticated 4 bedroom villa situated on a half acre site, adapting the “Yin Yang” philosophy and translating it into the spectacularly-designed luxurious villa. 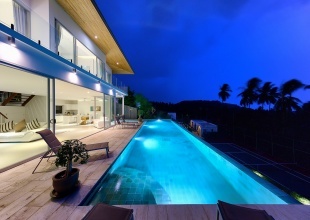 This villa is situated at one of the highest points in the Samujana estate. 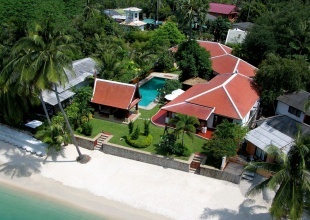 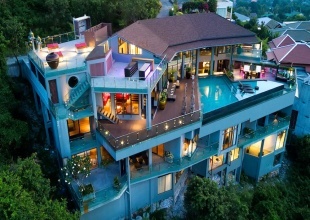 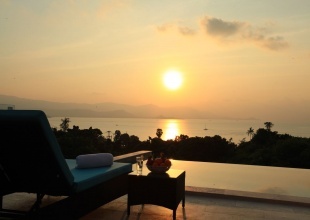 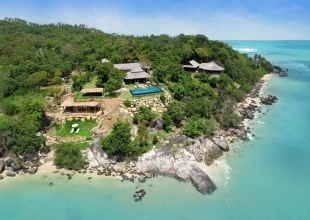 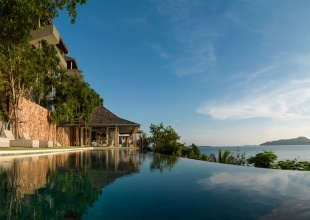 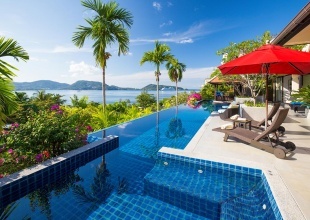 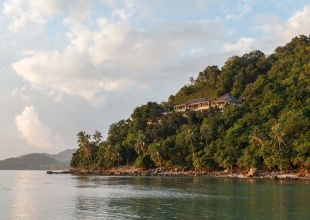 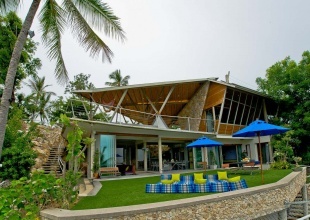 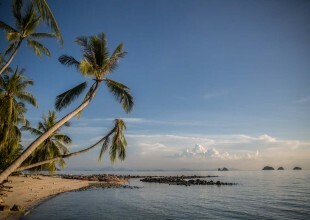 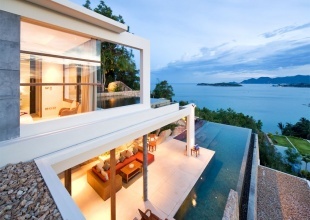 The beautiful villa enjoys panoramic southern and western views over the Gulf of Thailand. 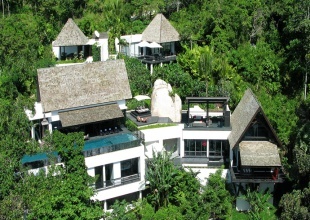 The villa also boasts a unique and large interior garden. 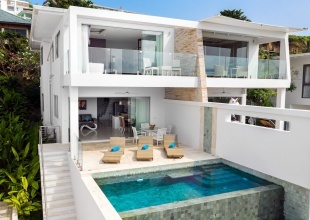 With four oversized bedrooms and five bathrooms there is plenty of space for groups. 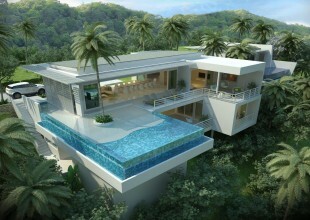 The villa also features a private gym, office space and a media room. 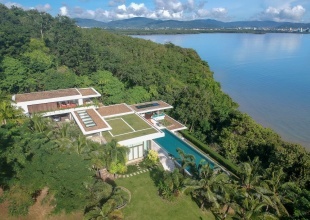 Perfectly poised on a quiet corner section of the estate and with breathtaking views, this villa is the epitome of contemporary and deluxe living. 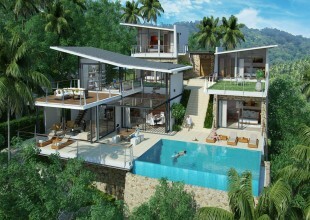 Each of the five bedrooms features an en-suite bathroom with freestanding bathtub and rain shower. 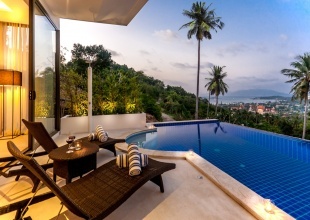 Perched near the top of exclusive Cape Panwa on the southeastern tip of Phuket, this three-bedroom pool villa features the finest five-star facilities, amenities and services to compliment breathtaking, panoramic sea views over majestic tropical islands. 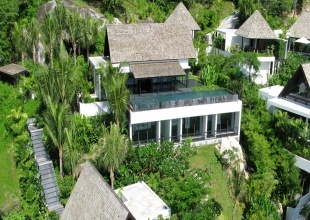 Villa 7 has four extremely spacious en-suite bedrooms and is positioned in an enviable hilltop position. 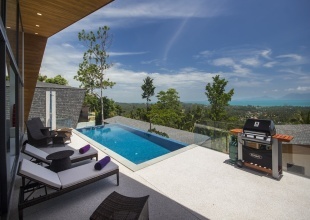 The villa has a large open plan kitchen and BBQ overlooking the stunning infinity edge pool. 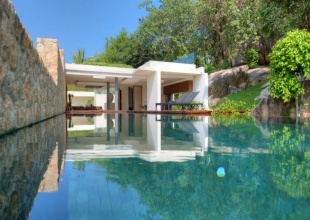 The pool also features a natural rock outcrop and a secret water bench. 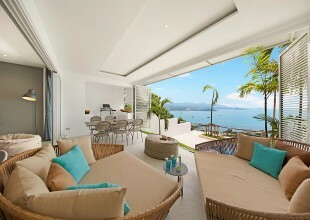 There is also a fully equipped AV room with a plasma screen television and a surround sound system. 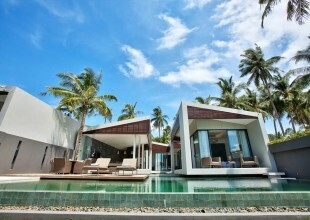 The first impression you get when approaching this villa is one of style, class and quality. 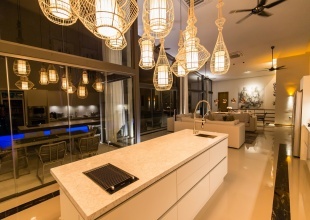 And this is confirmed and enhanced with each and every room you enter. 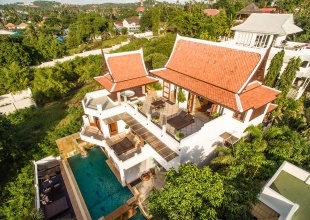 The villa sits majestically at the top of a gentle mountainside, just a few minutes away from the beach and the airport, and this villa has magnificent views over the floating temples of Wat Plai Laem and out across the ocean. 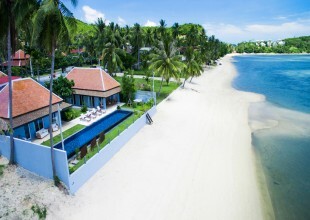 Located right on the beach, overlooking the Five Island and idyllically set amongst towering palms and exotic flowering plants, this is as near to Man Fridays Treasure Island as one can imagine. 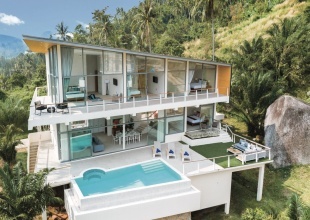 This authentic Thai-style house was lovingly created by a Swiss businessman, who spared nothing on creating a home of his dreams. 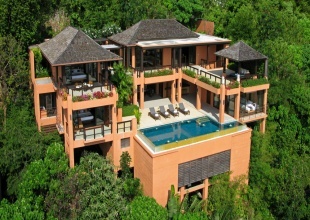 SOLDThis garden villa has five spacious en-suite bedrooms all with their own secluded garden or terrace. 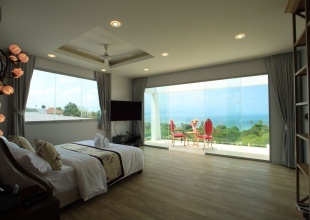 The master bedroom features a private, adjoining lounge that can be converted into an additional child’s bedroom. 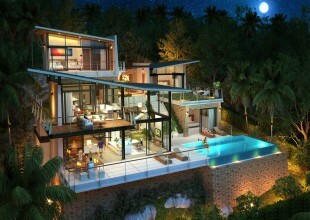 The comfy sunken open-air lounge is framed by the large infinity pool and gardens. 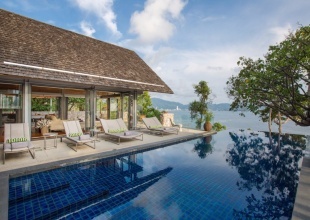 The open plan living area is fronted by a large infinity pool offers an enclosed private gym with stunning views over the bay. 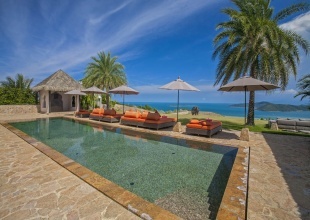 Villa 15 has four large en-suite bedrooms with king sized beds, all with freestanding baths and separate showers. 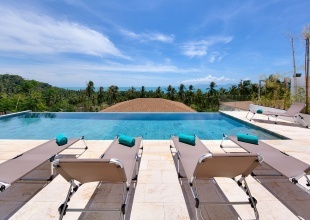 Each bedroom has an outside seating or daybed area for quiet time or your daily yoga routine. 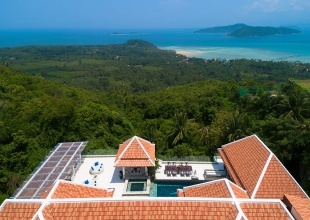 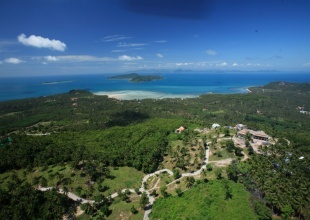 A brand new development of 11 villas all with panoramic ocean views over the bay of Bophut and out to the nearby island of Koh Phnagan.Buyers have the choice of purchasing 5 or 6 bedrooms with prices ranging from 36,950,000 to 44,200,000 THB.The design has embraced the Asian style indoor/outdoor living experience has caree has been taken to make them family and child friendly. 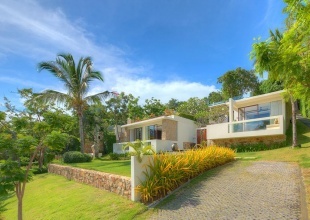 Villa 11A is a duplex villa with three en-suite bedrooms. 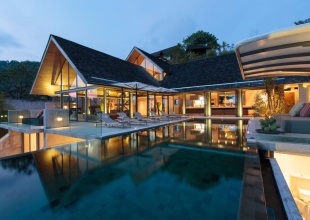 A striking entrance and landscaped gardens lead to a sizable outdoor area. 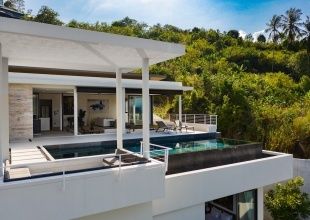 The villa includes a television lounge, open-air living and dining room overlooking the infinity pool and features a breakfast bar and chic kitchen. 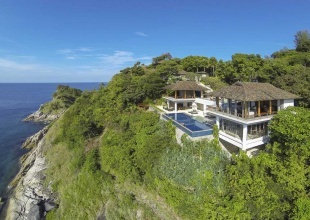 This villa has stunning sea views and a secluded garden featuring large natural rock formations. 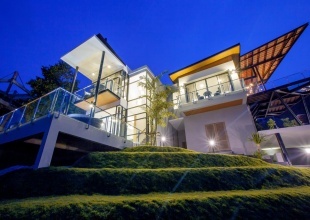 This residence is fully furnished to western standards, featuring three bedrooms, two en-suite bathrooms, separate lounge and dinning rooms and undercover carport. 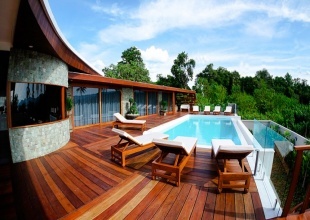 It also has a fully equipped western style kitchen and the villa is serviced with cleaning and gardening employee. 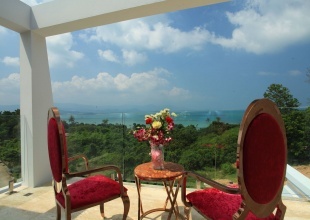 The master bedroom and first guest room offer beautiful coastal and sea views. 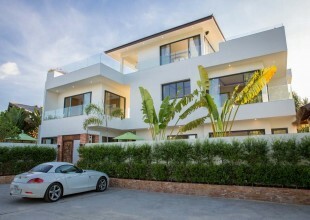 This villa was completely rebuilt and extended to its current high standard in 2015.The property was purposly designed to give two separate living areas, whilst being connected around a private swimming pool.The lower floor has 2 bedrooms and an open plan living room, dining room and kitchen area. 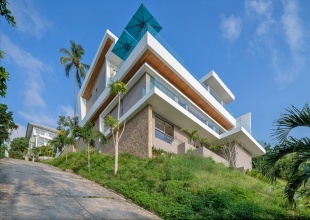 These sea view, semi-detached properties have rear access via the wide community road. 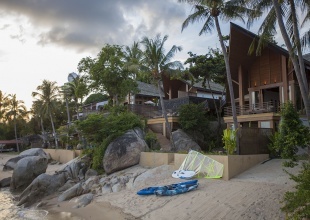 Off-road parking is via your own covered car port, whilst there is ample space for friends/guests to park on the community road. 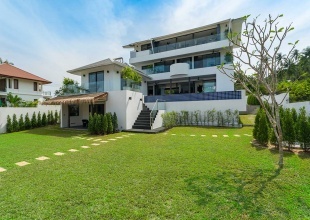 You enter each property on the ground floor which has spacious, and bright open-plan kitchen (with breakfast bar)/dining and living areas, and a guest w/c.